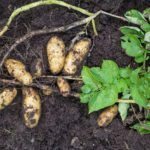 How to grow Yacon from the tuber? I bought a yacon tuber from the grocery. Can this still be propagated to grow rhizomes and eventually a plant? I'm sorry, these will not reproduce by tuber. Only the top rhizome portion will grow. These tubers are, simply, nutrient storage. On the rare occasion, there is some rhizome matter on the tuber that will root, but this is not typical.